Students and families are responsible for the upkeep of the OLG. 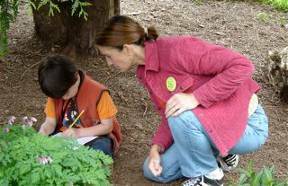 The Outdoor Learning Gardens (OLG) project was founded in Spring 2001 by Atkinson parents Em Scattaregia and Kate Raphael, who trained as Oregon State University 4H Wildlife Stewards through the OSU Extension Service. Atkinson parents and students designed and planted our first garden, a native plant wildlife habitat, and became a member school of the OSU 4H Wildlife Steward Program. A first grader studies in the habitat with the assistance of a parent volunteer garden rep.
At the start of each school year, parents volunteer as garden representatives for each classroom. They plan lessons with individual teachers deciding how classes will use the Outdoor Learning Gardens. Garden representatives take 5-7 students at a time into the outdoor gardens and/or classroom. While outdoors, the children are able to observe, investigate, plant, weed and harvest, write, draw, and dream. Garden representatives may also assist teachers with special projects, field trips and science curriculum not related to the gardens. We are always seeking new volunteer parent garden reps! We are looking for gardeners, cooks, artists, builders, grant writers, scientists, and nature lovers! Our Outdoor Learning Gardens are maintained by students, parents, families, and local community members, including students from Warner Pacific College who help with an annual garden clean-up. New OLG volunteers are always welcome! View our events page for upcoming events. The OLG has evolved into a committee of parent volunteers who help coordinate education and operations in our expanding outdoor learning gardens. We welcome new ideas and parent and community involvement; please let us know if you have any ideas or suggestions. We would like to thank the parents, staff, local businesses, churches, and schools who have helped us to maintain our Outdoor Learning Gardens. THANK YOU!